I bought this set in black for a wedding and it’s absolutely gorgeous in person. I was looking for pearls that weren’t too clunky and these more than met my expectations! 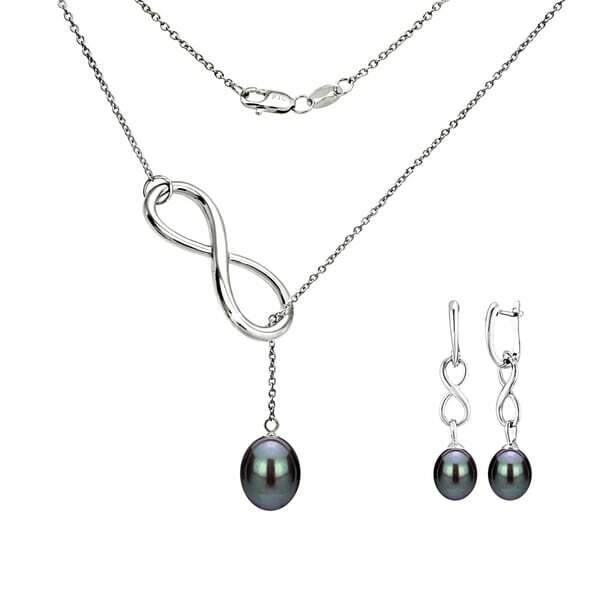 DaVonna Sterling Silver 9-10mm White and Black Pearl Lariat Y Necklace 17"
An infinity Lariat Necklaces Earrings Set represents a connection with all that is eternal and timeless in this engaging for her. The sterling silver Infinity Lariat and Black freshwater pearl hangs delicately from Infinity. The design is elegant and will take you anywhere- you will be able to wear them with casual apparel or for dress up occasions. Got this for my wife for Christmas and she loves it. Really is a nice piece. Was afraid it might be small compared to the pictures but it looks great. The shipping was fast on this item as well. Because my wife like dangling earrings and hoop earrings. "How long is the necklace?" DaVonna Sterling Silver White and Black Freshwater Pearl Necklace Bracelet and Stud Dangle Earring Set.